The Charlotte Villa 11 original construction was completed in 1985. The 12 single bedroom apartments includes one apartment designed for handicapped/disabled persons. The tenants are served with one common Laundry Room. 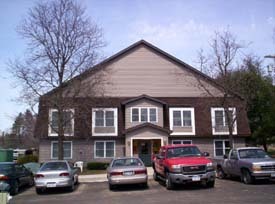 A common Community Room is located in the Charlotte Villa 1 building. The picture to the right shows the original look. Note the low roof profile, and that the front entrance is exposed to the weather. Winter snow and ice buildup often required that it be removed by shoveling. As the snow was often deep, its removal was work that was hard, and care was needed to not damage the roofing. The 2007-2008 rehabilitation of mostly the building's exterior created a dramatic change in appearance. The picture below and to the left showsthe dramatic changes to the same front elevation. 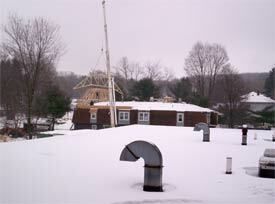 The peaked roof was accomplished by installing new roof trusses above the existing. The new roof profile better handles the heavy lake effect snow accumulation in this snow-belt area in Chautauqua County. The colors of the new vinyl siding and the roof were selected to show a rustic theme. The colors selected also have a connection with the Charlotte Villa 1. For tenant and visitor convenience, the rear entrance, which had some natural weather protection, received a new roof extension that better shielded that entrance from weather. The front received a new closed in Foyer. Tenants appreciate this feature as it provides a place to wait for a ride, more convenience when entering with arms full of packages, and a great place to carry on a conversation with neighbors. The, what has been referred to as "bump-outs for the second floor windows, were all demolished rebuilt, and new energy efficient windows installed. 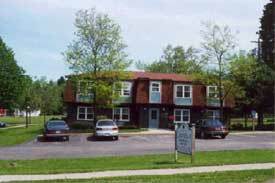 This work was financed by a rehabilitation loan of approximately $400,000 from the USDA, Rural Development, and equity invested by local investors from the Sinclairville Housing Limited Partnership 11, Tenant Rental subsidy is provided by the NYS Rural Rental Assistance Program. There is also a level of concern as the original construction reaches completion that proposed tenants might not really like what has been created, and might not want to live there. Several apartments were rented quickly as the as the project opened, and Mr. Nelson was given a hug, and a teary eyed woman told him her apartment is the nicest home she has ever had. That was a event to make one feel they did a good job. Given that was 1985, it is also something that is remembered. In the late 1990's, the winter icing difficulties had become severe enough that was clear that the roof design needed to be altered.